Private, Secluded and Relaxing ..... We want you to feel like you own the place ! Your neighbors, Red and Champ take a peek at the new visitors. A large expanse of windows will provide your own private view. Then at the end of the day, you'll want to draw a luxurious bubble bath in your 2-person Jacuzzi Sweet Southern breezes drift over you through the open windows while you watch the sun set over the hills...and soak till the stars come out... The bathroom also include a seperate shower, and a washer and dryer... Feels like Paradise.!!! Next morning, sleep as late as you like....no need to answer a bell for a communal breakfast with people you don't know. We offer three different breakfast options. You can bring your own groceries and cook in the fully-equipped kitchen. Or for an additional charge we will stock the kitchen with breakfast foods for you to cook at your convenience. The third option is a full country breakfast prepared by the innkeeper and served to you in your Guesthouse. Bed Trays are provided if "breakfast in bed" suits your fancy. Check our Rates and Policies page for complete details and pricing. We're proud to be a little bit different .... We want you to feel right at home... so we specialize in privacy and individual control for you....laced with a little Southern hospitality from us. The complete private kitchen and eating area provide all the comforts of home: stove, microwave, refrigerator, coffeemaker and more. Please check out our "Rates and Policies" page for details and pricing! You'll also have plenty of room to stretch out and relax in your large den with hide-a-bed sofa, and recliner/couch, HDTV with Satellite, Free Wi_fi, and other amenities! 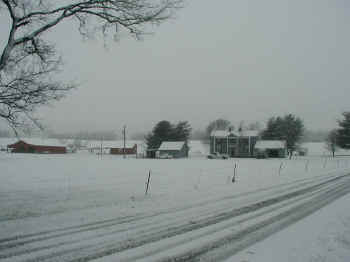 This is a larger view of our place in the snow....the guesthouse is behind the last barn on the left...very secluded..accessed only by a long private driveway past our 110-year-old farmhouse. Windows span the back of the guesthouse and give a great view of surrounding hills. 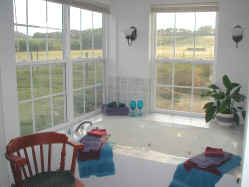 Open the windows on both sides of the 2-person Jacuzzi and you can relax in the soft breezes as you watch the sunset. No neighbors, no traffic, just you and Mother Nature. 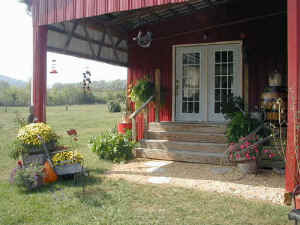 Tennessee Horse Country to make your reservation. 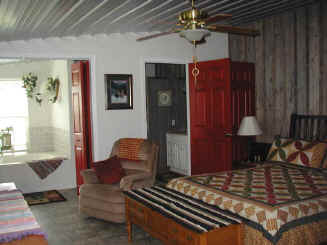 ....Or check out our smaller cottage.